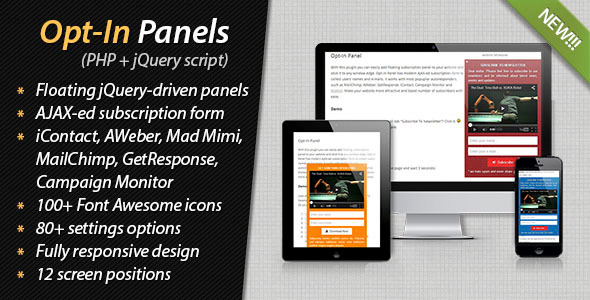 With this script you can easily add floating opt-in panel to your websites and stick it to any window edge. Opt-In Panels has modern AJAX-ed subscription forms to collect usersâ€™ names and e-mails. It works with most popular autoresponders, such as MailChimp, AWeber, GetResponse, iContact, Campaign Monitor, Mad Mimi. Make your website more attractive and boost number of subscribers with ease.